An effortlessly elegant Missoni Mare® Lurex Net Long Cardigan Cover-Up was designed with the jet-setter in mind. 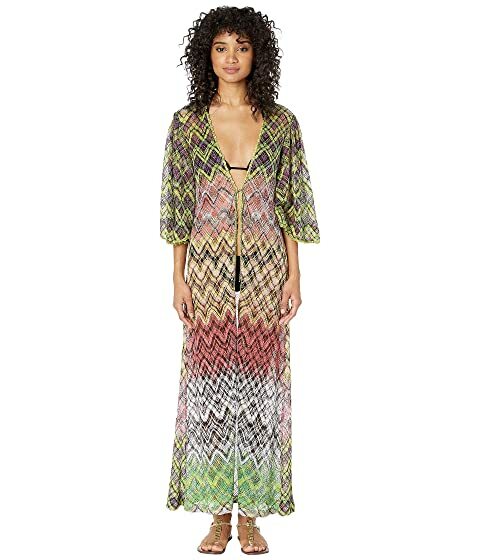 The full-length, cover-up is crafted from a lightweight viscose woven with a chic print throughout that lends a versatile wear from poolside lounging to happy-hour drinking. Sensual V-neckline with contrast stitching. Adjustable tie right below the bustline. Quarter bell sleeves with decorative contrast stitching at cuffs. Materials: 74% rayon, 15% polyester, 11% nylon. Product measurements were taken using size 42. Please note that measurements may vary by size. We can't currently find any similar items for the Lurex Net Long Cardigan Cover-Up by Missoni Mare. Sorry!